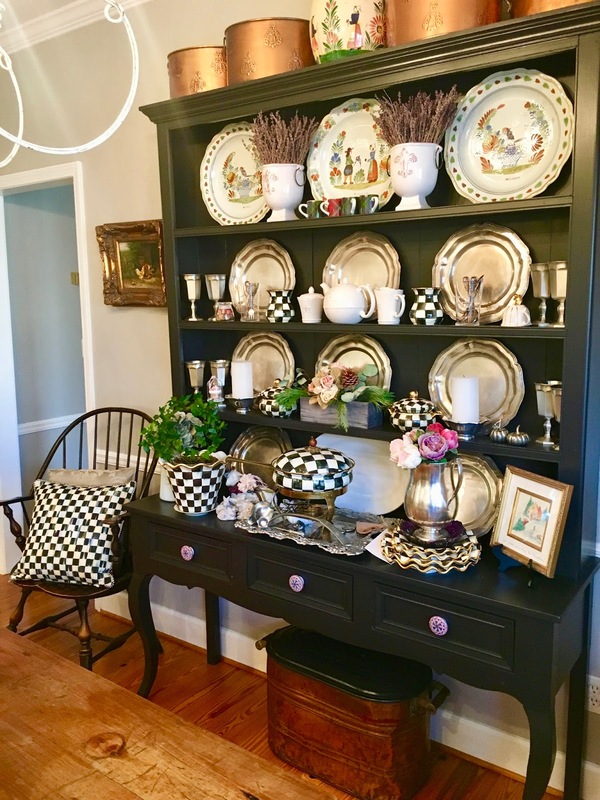 I have to show you my sister's score, MacKenzie-Childs had a great sale with Frosty marked down. Last time I looked he was back full price! Isn't he the cutest! Do you see his eyes, coal! reminder it is winter. This year we don't need any reminders. Remember, we have snow on the ground! My bedroom without the holiday duvet. I haven't added any winter linens, yet! 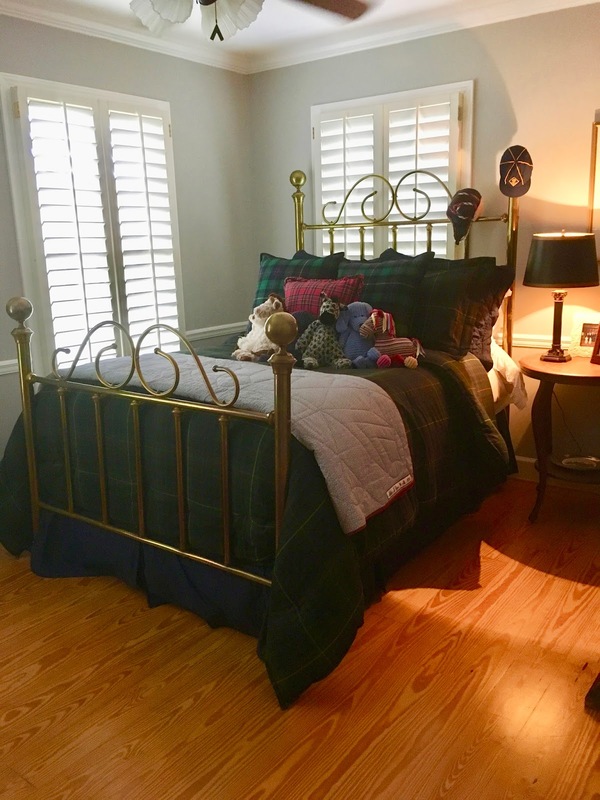 And another guest room (Connor's room when he's here) with tartan linens and comforter and Connor's stuffed animals he says he is finished with. I gave him these over the years and he brought all of them back to me! 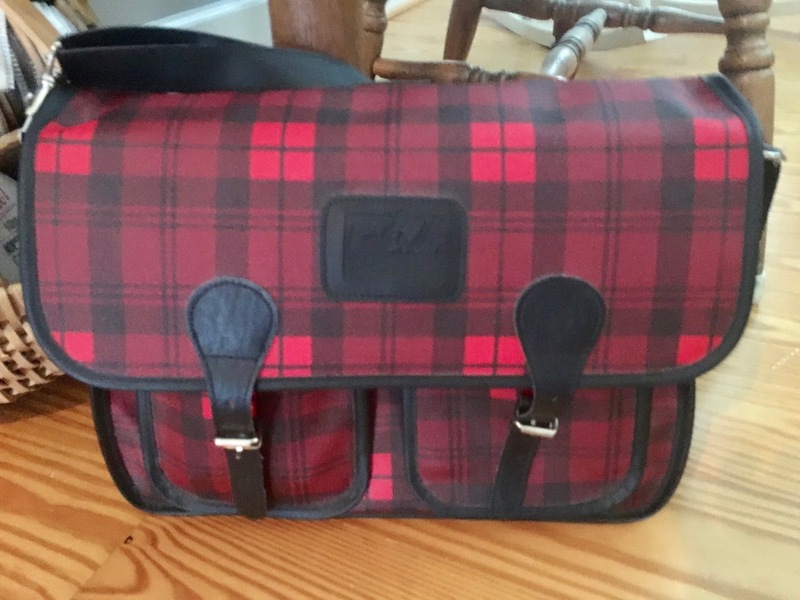 My tartan school bag I keep next to the antique teachers desk. My sister found it at American Girl many years ago. It holds a reader, tablet and crayons. Well there you have a little winter tour of some of my home. I hope you will leave a comment, it's the only way I know you stopped in. 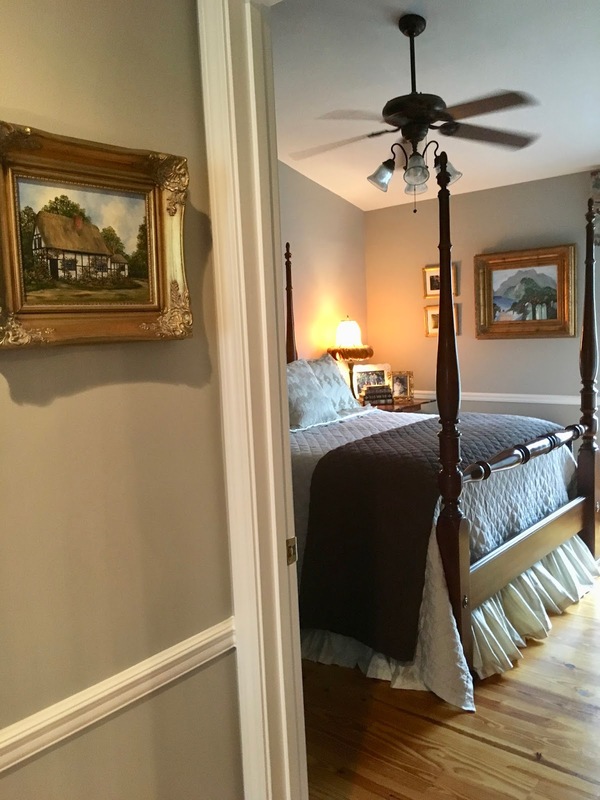 Oh Emily, your home looks wonderful adorned in plaid and Juliska! January is great for decluttering and re organizing and it looks like you've been busy! The MKC snowman is adorable, I bet you could make a knock off...I think my favorite photo is the baker's rack, swoon! I know you're looking forward to warmer temps and thawing out in the next couple of days, Happy Weekend! I've been busy shredding old financial records and getting everything ready for taxes!! Blah I know but needed. 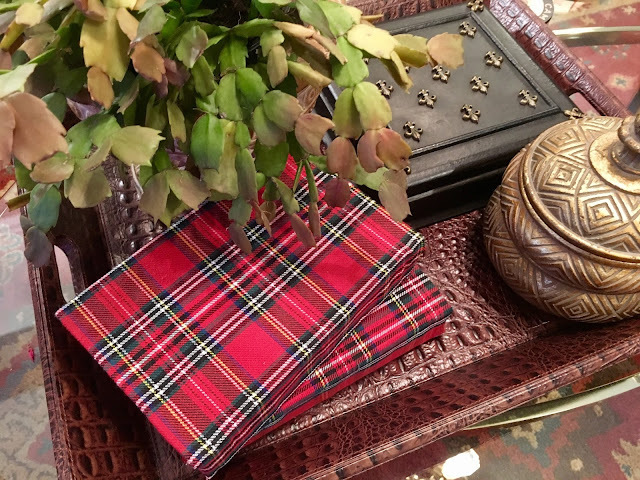 Your touches of tartan helps the slump after Christmas, every room is lovely. 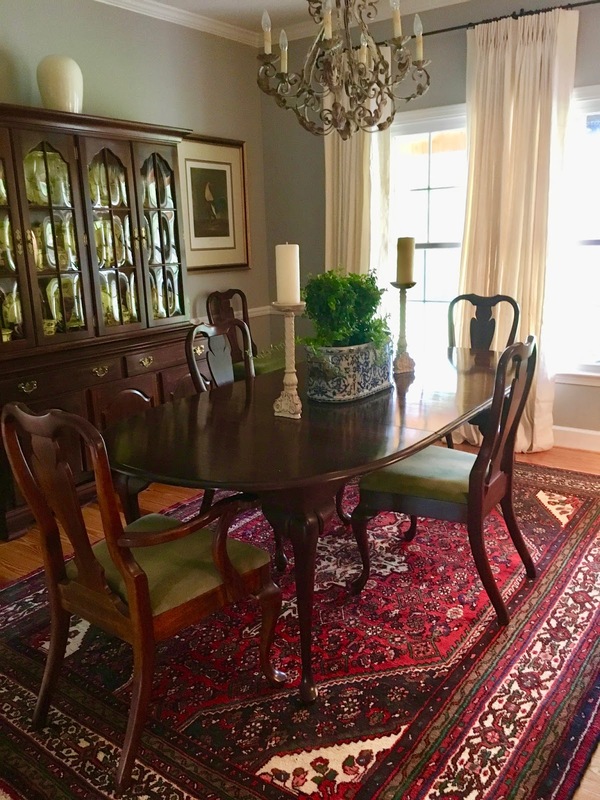 Oh that table!!! Wow! 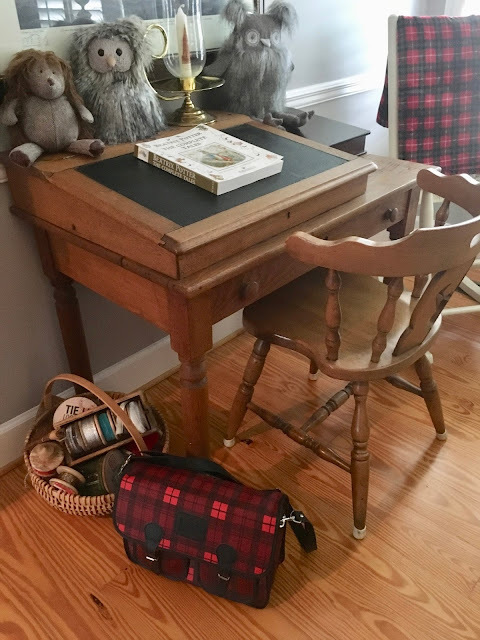 The tartan is one of my favorite things and I put out a tartan thermos after Christmas on my back screened porch. 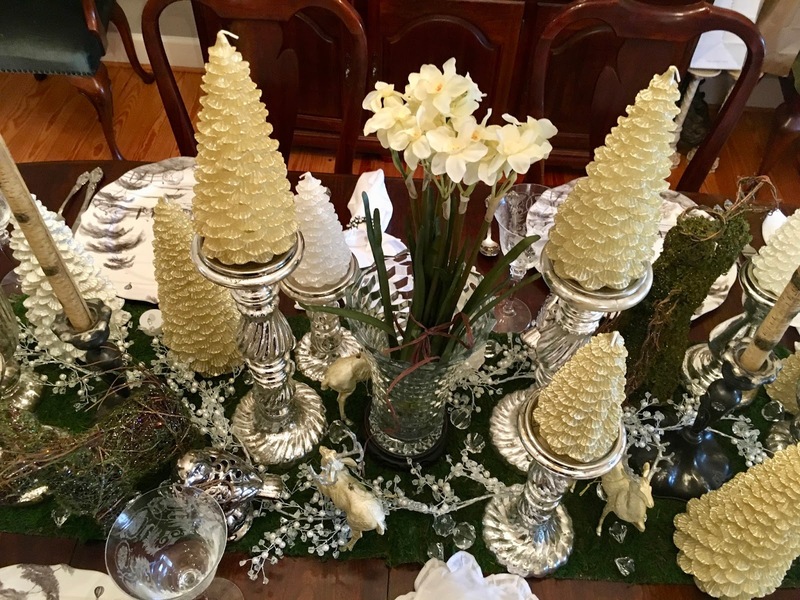 Mr. Frosty is a charmer for sure, but I keep going back to the beautiful table setting! Happy 2018, indeed! 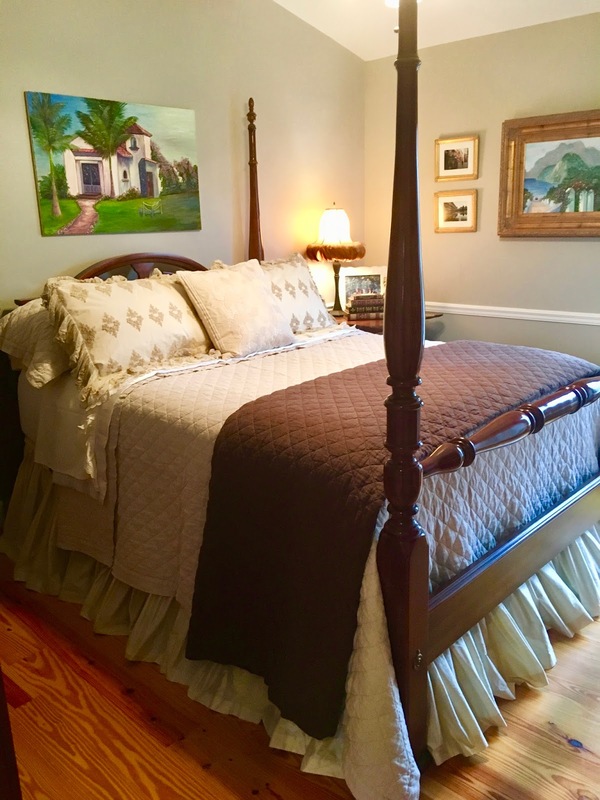 Love, love, love each and every room!!!!! That study is GORGEOUS! I now have ideas running through my head to revitalize ours! 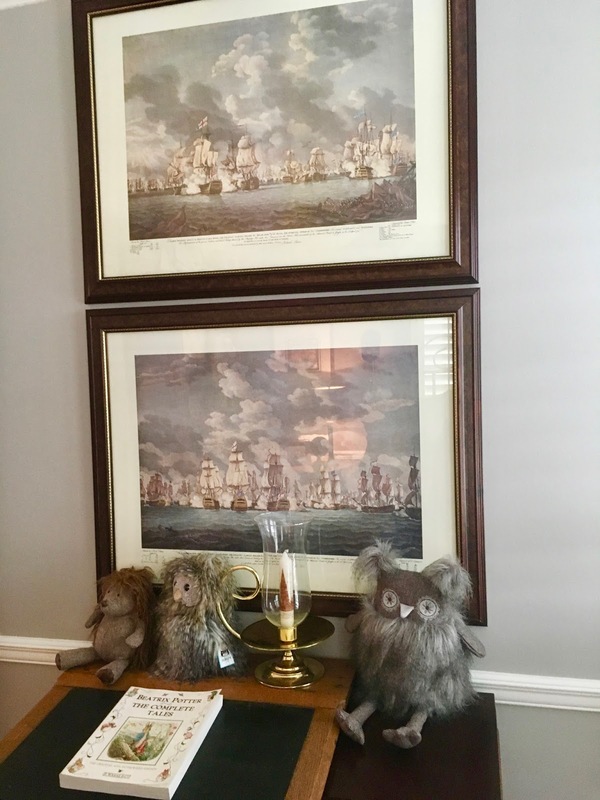 Both of your hutch arrangements look great. 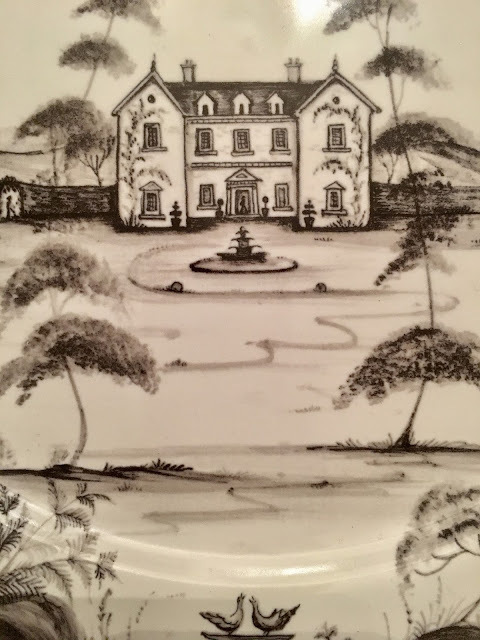 I love all your china patterns and collections. 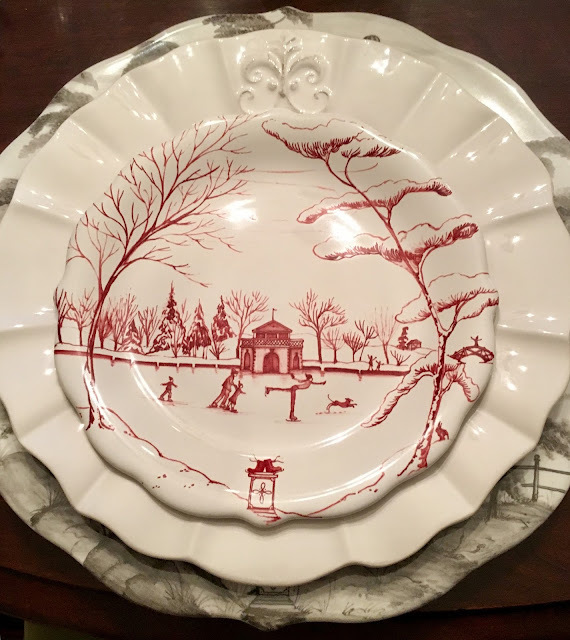 I've always liked your Juliska winter scenes and your Anthro plate with both plate stacks looks good.It was fun to have a tour of your dining room, study and bedrooms. Love your pine floors and your DIL and sister's art work. I was struck by your mirror in the dining room. It's a beauty. So much beauty to see and I enjoy your decorating flair. Oh, Emily, thank you for sharing your home with us! I love it! ALl those dishes - the Juliska, the Quimper and those from Anthro - so fine, so fine. Stay warm, my friend. This January has been a little tough so far, what with all the flu and abnormal cold and snow! Love love all your photos. WOW! You have amazing talent! I'm in love with that cute little owl and the peacocks are outstanding! 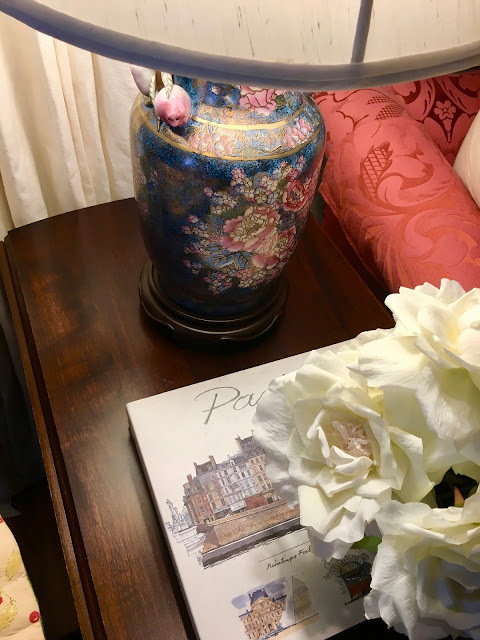 Your entire home is a study in taste and beauty. I was trying to decide which room is my favorite, and I think it is Connor's room. 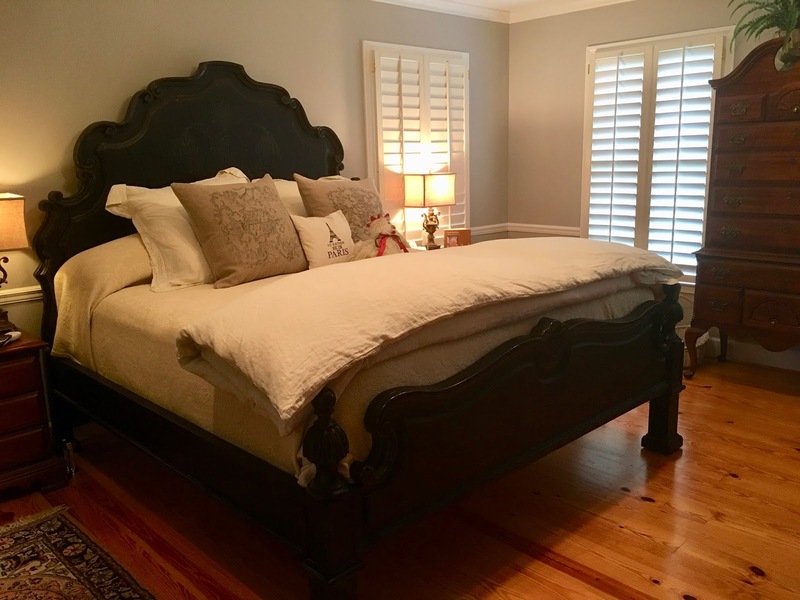 I love brass beds and tartan, and why NOT display those stuffed animals? That tartan school bag (which we used to call a book satchel😀) is great. The fact that you put the old school things in it is wonderful. Would love to see you when you come to Birmingham, but not right now -- I am probably still contagious. Yuk! First of all, I love your study. I think it's so cute with all the books piled in the middle! 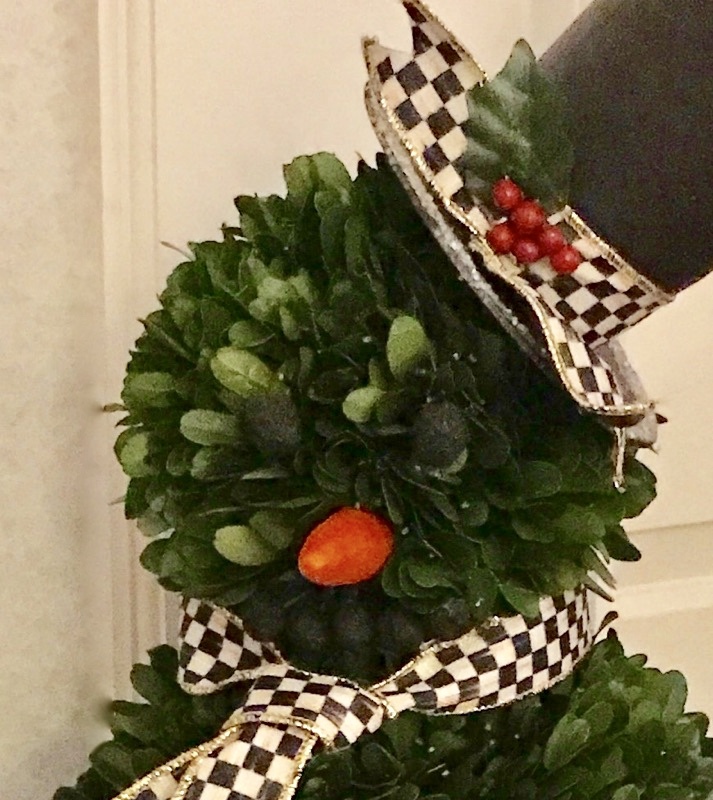 And you know I love the cute little MacKenzie-Childs Frosty. He as adorable! 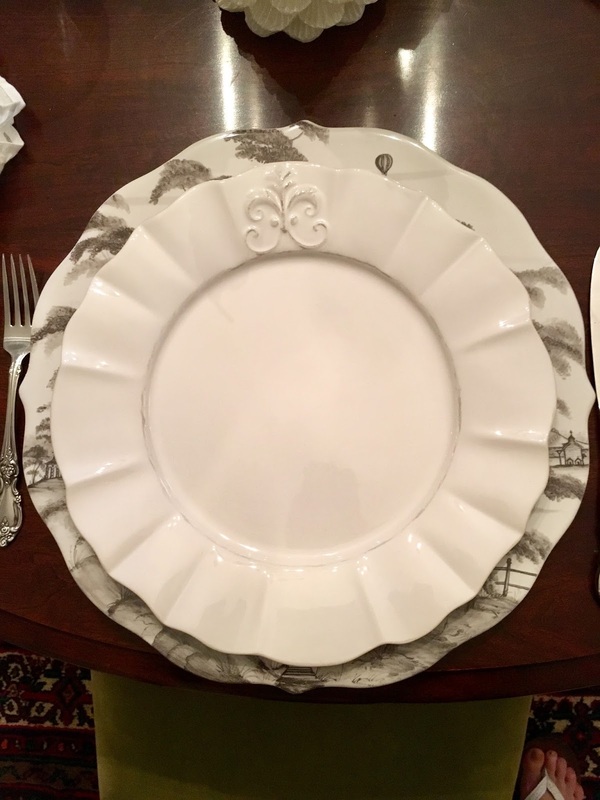 Your home is so pretty, and I love how you put the three plates together...they really work! Beautiful home - and your Juliska dishes are lovely! 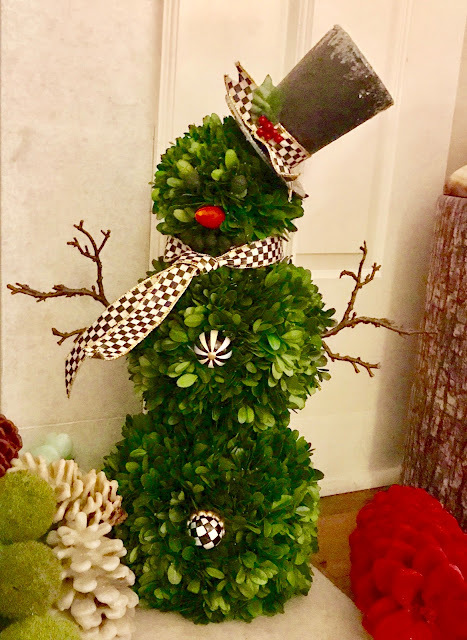 Love your sister's snowman - MC had a lot of items on sale, but I resisted this time! It was difficult!! I don't think I have any tartan (Sarah has a lot and it always catches my eye! ), but those chargers - Oh I like those!! Your have a beautiful home. I can’t help but admire your fantastic dish collection and the lovely furniture you have. 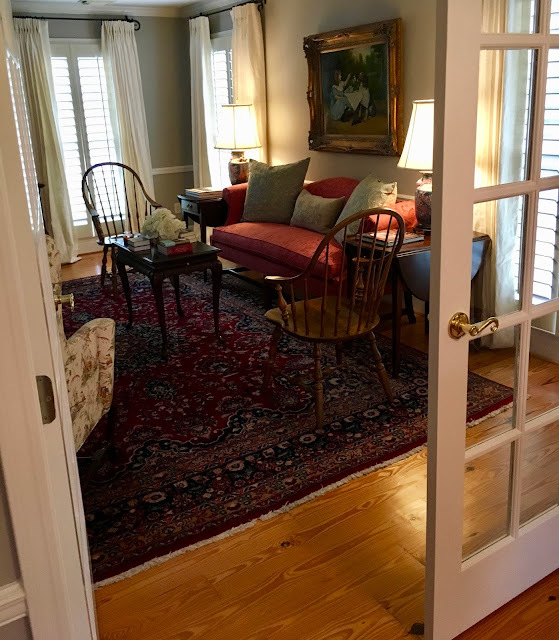 Your wood floors are beautiful. 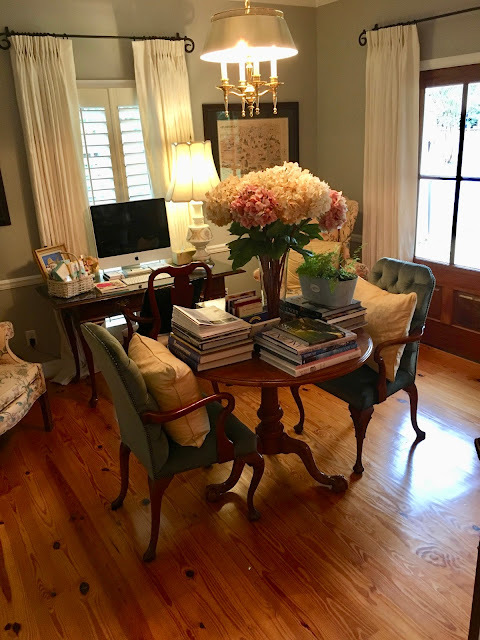 Love the study- enjoy the winter weather (what else can we do?)! Tartan is definitely a pattern that screams 'winter', and you even have a cool bag! I lov your 'french' hutch too. So elegant and a wonderful display item. And don't get me started on your mirror! Your home is stunning, Emily. 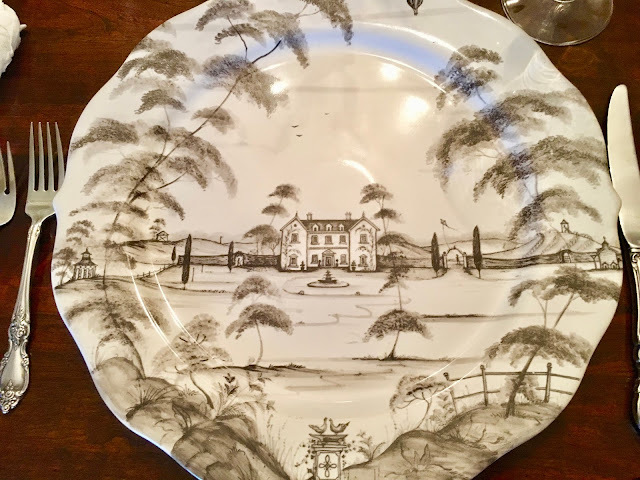 I am so in love with all of your china! 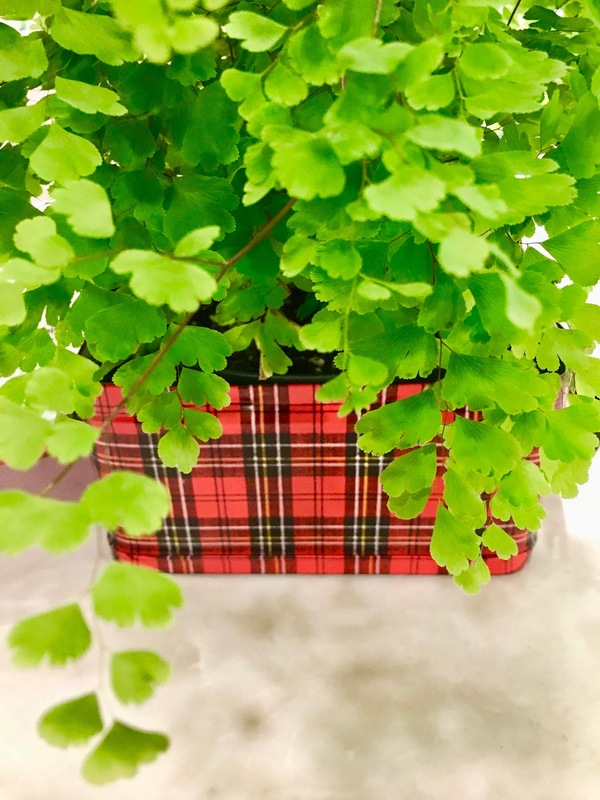 I love the tartan school bag next to your desk. Have a wonderful week, Emily! Quel bel intérieur, si chaleureux et décoré avec un si bon goût ! Je suis fan de ta vaisselle rouge et blanche, superbe ! 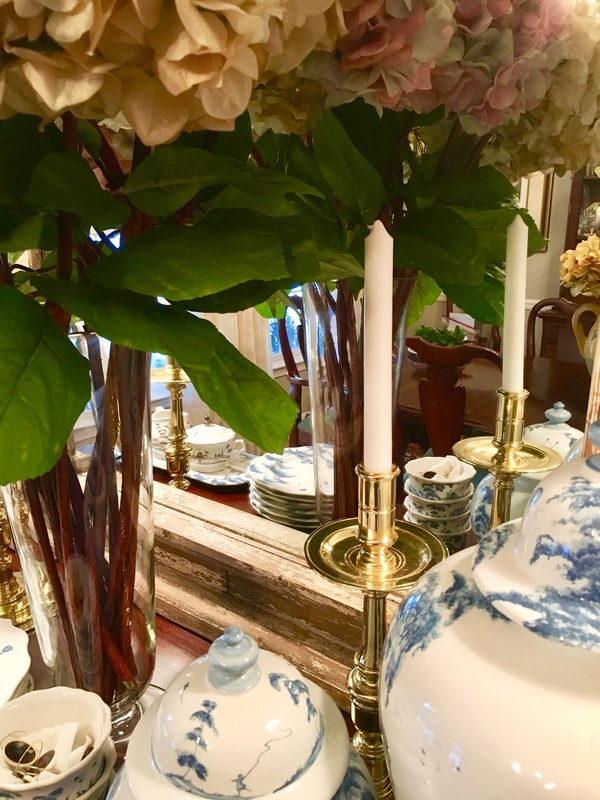 You are so lucky to have those marvelous sets of china!!! Your home is so beautiful, no matter what the season. 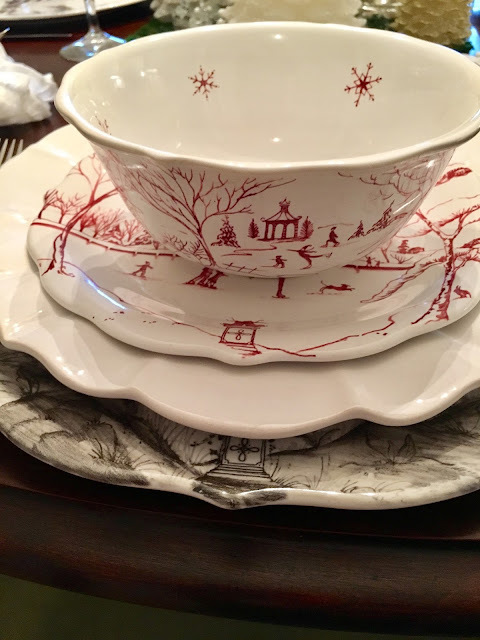 Loving the china and that flower with the tartan edging and of course, Beatrix Potter and the toys. Next year I have to make one of those Mackenzie snow people. It's about as cute as it gets! 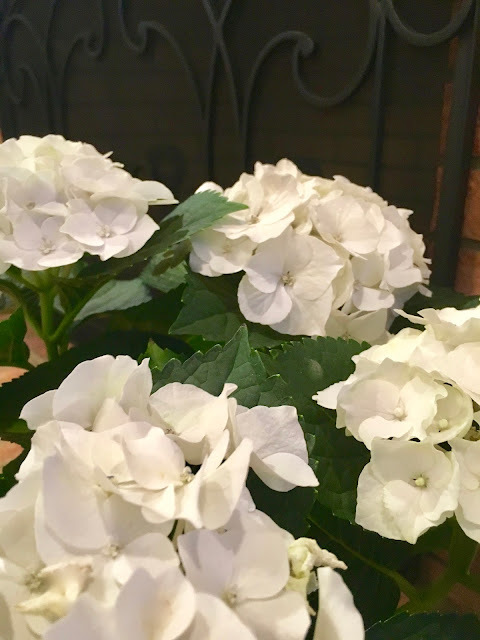 Isn't it funny that we are all drawn to flowers during this time of year - the house feels so empty without the Christmas and flowers give us some hope! We haven't had snow at all and we got season ski passes for the whole family! Yikes!!! It finally dumped about a foot in the mountains so that was good. I just love Frosty - he is so adorable! Your baker's rack filled with MC is fabulous too! Obviously I need a lot more MC!!!! How lovely and inviting your home looks. We spend so much more time indoors during the winter, it is nicer to spend it is such lovely surroundings. 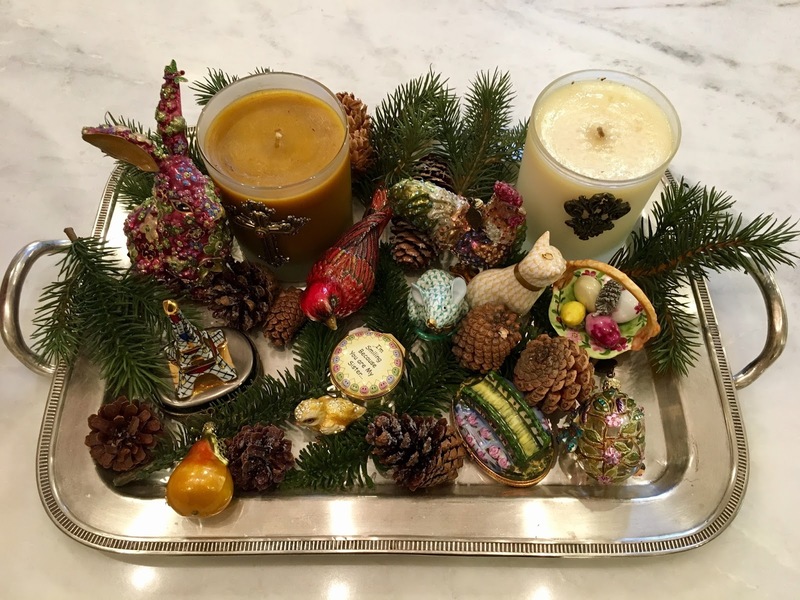 Emily, I love how you have your home for the winter months, it looks so warm and inviting. Hi Emily, I enjoyed my peek around your home and seeing all the pretty touches of white, tartan, and a little sparkle. Your sister sure scored on her frosty, didn't she? I love getting everything back to normal after the holidays. Your hutch looks beautiful, and I've always loved those Juliska red and white dishes of yours. I hope you have a happy week, Emily! 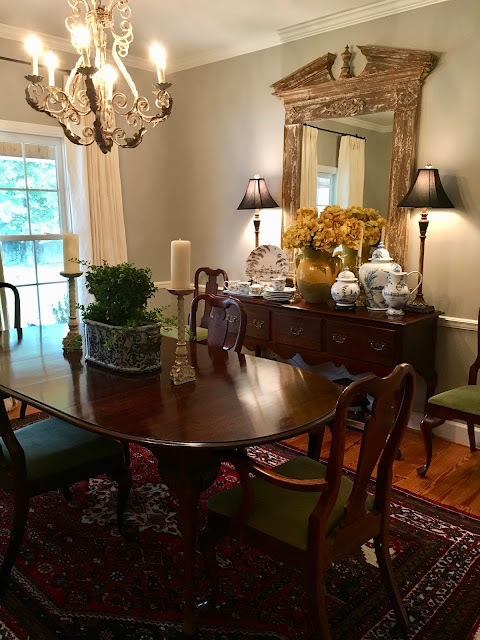 Emily, your home is gorgeous! Love the tour. It's so special to take a peek. 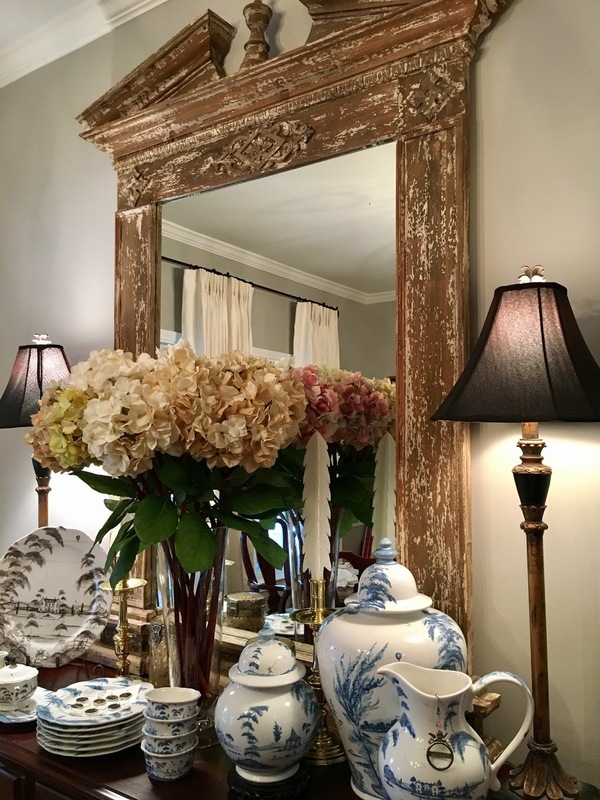 Loving the pretty plates and of course your beautiful hutch all decorated. Your sister got a bargain. Happy weekend dear friend.